Collins Memorial Library has set up a popular reading collection of current materials. This is in response to students’ recurring requests for “popular fiction.” The collection, which will hover around 200 books but currently consists of 168 titles, will be updated monthly to incorporate new material by popular authors. 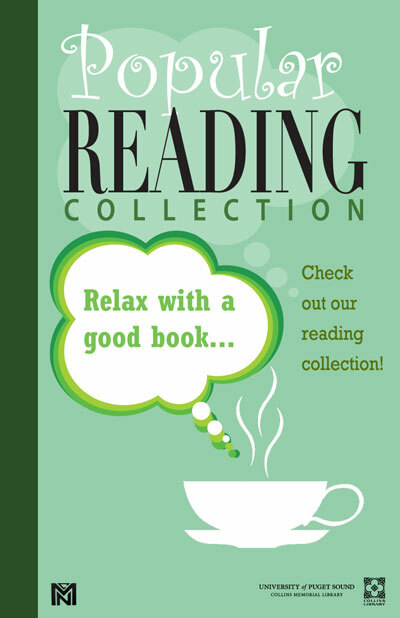 It consists of fiction, biographies, and popular authors on non-fiction topics and is searchable through Collins Catalog and available for browsing in the reading room of the library. One-third of the collection (54 titles) has been borrowed from the library since early December, when the collection became available for circulation. To make this collection available to students, staff, and faculty while continuing to purchase materials to support learning and research, the library is using funds from an endowed gift. We lease the books from a holding company at a reasonable rate, so we can exchange them over time and keep the collection current. Borrowing rules are different from those for other collections. We loan these books for three weeks, with one renewal possible. Only two books from the popular reading collection be on loan to a patron, so that the small size of the collection can serve the full range of patrons. This is meant to help us reach our goal of promoting reading for pleasure and entertainment! To learn more about this effort, visit our subject guide! This entry was posted in Focus on New Services, Popular Reading Collection, Recommended Reading. Bookmark the permalink.